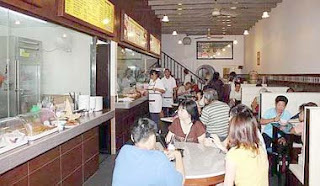 ﻿The Kopitiam operate by Lim Family, which spend approximately RM5million to acquired 12 pre-war buildings in Ipoh for conservation as they are passionate about everything vintage.The family decided to “start small” by restoring the shop next to Oversea Building, formerly occupied by an insurance company, into a kopitiam. 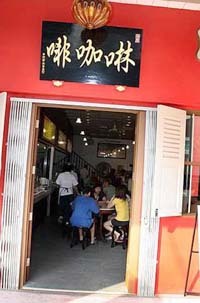 The shop’s name means Drink Coffee in Teochew, the clan which Lim Chai Hock belongs to. The building had housed the Bank Of Malaya, the first Chinese bank in Ipoh founded in 1920 until it was forced to close in 1930 due to the Great Depression. Later, it was taken over by Overseas-Chinese Banking Corporation Ltd. “Restoration works and the starting of Lim Ko Pi cost about RM450,000,” said Lim Chai Hock 52. Perak State EXCO Dato' Dr Mah Hang Soon also visited the Cafe after knowing the family invested such amount to preserve heritage in Ipoh. The family also offer 1st floor of the building as a venue of meeting for those who passionate about vintage, antique and heritage to meet regularly. The special feature of this kopitiam is that at the back of the shop, there are 2 separate enclosures which can accommodate 2 kopitiam tables. It is open air and has a garden theme at the back of the shop, with port holes and airwells characteristic of turn-of-the-century shophouses, gracefully set off by potted plants. Their bread and homemade Pao ( Buns) is reputable. Oversea Building next to it would be restored and made into a budget hotel. Yellow Pictures Sdn Bhd produced a series of cultural documentary on Malaysian Chinese. The documentary has been supported by and air via Astro AEC. The documentary explore heritage , vintage, history, antique , cultural of Malaysian Chinese in Malaysia. DVD Collections are now released. The DVD documentary series in Mandarin version with English and Malay subtitle. Despite with English and Malay subtitle. It is a bit difficult for non-Chinese educated people to view the series. I hereby share my guide for non-Chinese educated people to watch the series. In conjunction with anniversary of Penang being declare World heritage site tomorrow (7 July 2011). We start our review on documentary series that cover Penang's ( Pulau Pinang ) heritage, history, vintage, antique and festivals for those who passionate about above and tourist. For those who non- Chinese educated. We encourage you to start with Episode 9 of <Malaysia My Home> (pic above). Especially for those who passionate about heritage,vintage, antique and history. This is because the documentary in such Episode interview a Baba-Nyonya. Baba-Nyonya are descendants of late 15th and 16th-century Malaysian Chinese. Due to the fact that they were mostly English educated, some lost the ability to speak Chinese. Their native speaking or mother tongue are English. Thus, they speck English rather than Chinese. Thus, non-Chinese educated people able to understand what she speak and won't get bore. The Episode also interview Teresa Capol, an Indian lady who passionate about heritage, vintage and antique collection regardless of race. Thus, a large part of the Episode 9 converse in English. It seem those non-Chinese speaking are more passionate in preserving our Chinese heritage. They are activists behind Penang Heritage Trust.The Penang Heritage Trust is an organisation set up to promote the conservation of Penang's heritage and to foster greater awareness of the history and heritage of Penang. This episode also features Penang Heritage Trust. 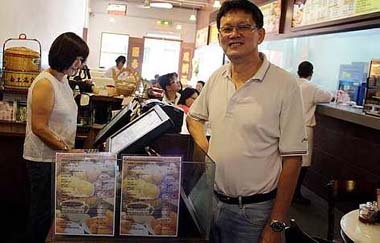 Teresa Capol also operate Edelweiss Café, Edelweiss Cafe provide "good food and drink in heritage environment". The cafe house a little museum which can be view if owner is not busy. The cafe house a lot of Teresa Capol vintage & antique collection. You able to watch Edelweiss Cafe in the Episode. Teresa Capol also bring us to visit Lorong Kulit (off Dato Keramat Road)http://youtu.be/VqS75T62dlg in the documentary, a Flea market where you can shop for your vintage & antigue collection at bargain price at Georgetown, Penang. The Episode also features Tan Yeow Wooi 陳耀威, an architect, who passionate and specialise in restroring heritage building, A Sketches artists, and another heritage tour guide at Penang Heritage Trust Lim Sheau Fung. The second episode we recommended for non-Chinese educated is Episode 10. Episode 10 features Chew Jetty, one of the Clan jetties, is part of Penang heritage trail. The Clan jetties are named after the last name of the residence. The Clan jetties consist of eight jetties, named after their surnames, “Lim”, “Chew” “Tan”, “Lee”, “Yeoh”, “Koay”, “Peng Aun” and Mixed Clans. Clan Jetties, is a very unique lifestyle in Penang, and it has long been a living heritage, especially those built along Weld Quay of Georgetown. Chew Jetty still remains as the largest water village among the rest.Riding on the city’s successful listing as a Unesco World Heritage Site, a Weld Quay clan jetty resident here has initiated a homestay programme for tourists to experience life on the famous waterfront settlement. Other part of <Malaysia My Home> explores the customs, religious beliefs and education backgrounds of Malaysian Chinese. Unfortunately, other episode in the DVD not related to Penang ( Pulau Pinang ), We will write a review on other episode later. Now. Let see another DVD in the series related to Penang ( Pulau Pinang ). The second DVD series that relatd to Penang is <My Roots>. This is more on Festival in Penang ( Pulau Pinang ). Penang is one of the most colourful places , in terms of its wealth of culture. Due to its racial mix, there is always a festival happening around the corner. The above DVD <My Roots> features 3 festival in Penang usually around Jan & Feb each years. There is a saying that states you have not truly experienced Chinese New Year until you have celebrated it in Penang. The reason behind this is because Penangites celebrate Hokkien New Year in addition to Chinese New Year. You must be thinking – what? Hokkien New Year? How is this different from Chinese New Year? Basically, Hokkien New Year is celebrated on the 9th day of Chinese New Year. The Hokkien New Year is to celebrate the day when the Hokkiens escaped mistreatment by ruthless army in ancient China by seeking refuge in a sugarcane plantations. The Hokkiens emerged unharmed on the 9th day of Chinese New Year, and it was then considered as new year for the Hokkiens. The 9th day of Chinese New Year also coincides with the birthday of the Jade Emperor of Heaven (Thni Kong Seh). The Hokkien community in Penang celebrates Thni Kong Seh around midnight on the eighth day, by praying to the Jade Emperor of Heaven (or Thee kong – translated as “king of the heavens”). While most homes would have their own celebration and prayers, the largest celebration was in Chew Jetty. The Chew Jetty has one of the biggest community Thni Kong Seh celebration in Penang. The celebration was held on the eighth day of the Chinese New Year , and started from around 8pm to midnight. Episode 7 of <My Roots> features how Chew Jetty celebrate Hokkien New Year, a tourist attraction. Chap Goh Meh is the last day of the Chinese New Year in Penang. Chap Goh Meh is also known as the Lantern festival although it should not be confused with the Moon Festival (Mid Autumn Festival), which is also known as the Lantern Festival. Chap Goh Meh ends the 15 days of the Chinese New Year and in Penang, with its large Chinese population it is always a big celebration. Penang 'Tua Pek Kong' Float Procession during Chinese Valentine Day (Chap Goh Meh) organised by Poh Hock Seah Temple. Episode 4 : Malaysian Chinese in involvement in celebration of Thaipussam. The Penang Thaipusam is notably the biggest Indian Festival in Malaysia. The other popular location is Batu Caves, in Kuala Lumpur. Most tourist I talked to, planned their holidays to Penang to join in this colorful celebration. You have to witness this grand pilgrimage of Hindus coming from all states of Malaysia during Penang Thaipusam. Not excluding the other races, they can be seen carrying trays with coconut, vibuthis (holy ashes) and flowers to offer to Lord Muruga. The Penang Thaipusam is notably the biggest Indian Festival in Malaysia. The other popular location is Batu Caves, in Kuala Lumpur. Most tourist planned their holidays to Penang to join in this colorful celebration. You have to witness this grand pilgrimage of Hindus coming from all states of Malaysia during Penang Thaipusam. Not excluding the other races, they can be seen carrying trays coconut, vibuthis (holy ashes) and flowers to offer to Lord Muruga. Documentary DVD <My Roots>. features few malaysian Chinese, who celebrate Thaipussam, an indian festival. This is a mix of cultural between Chinese and Indian. One Malaysia already happen. 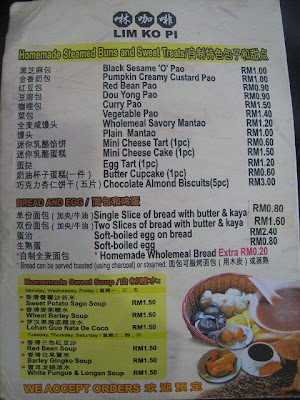 Malaysia, truely asia.. The above two DVD in Mandarin (Chinese) with English & Malay subtitle, available at Popular book store in Malaysia. Overseas buyer can email to us or visit our various web store link available at our Facebook.